While on sick leave at home in Murphy, Cherokee County, North Carolina, with his loving family and in hopes of recovering during the cold hour on January 3, 1864, Lt. Col. William C. Walker was awakened and murdered by common citizens turned outlaws – miscreants and cowardly men who knew Walker from before the war and had now used the four year conflict for their own bloodletting. 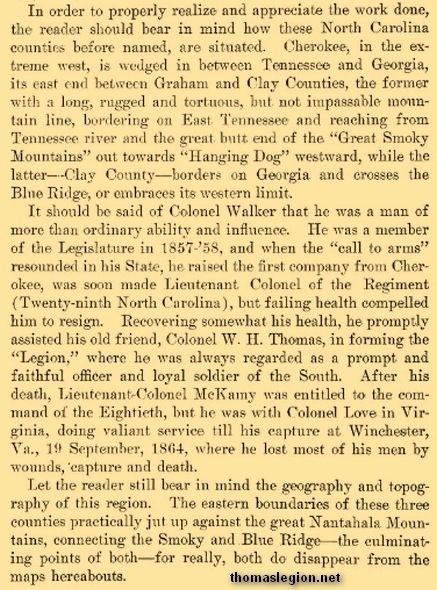 The cold-blooded murder of the commanding officer of Walker's Battalion was merely another senseless act that was born of Civil War in the rugged region known as Western North Carolina. While it was the setting of lawlessness, this was the region that became host to a war within a war, an Uncivil War, and it was filled with such disenchanted men who had fled the Conscription Act, another term for draft, and those of the baser sort, men who would use chaos as the ultimate diversion while they unleashed punishing blows on communities that just a few years ago were known for being calm yet charming Southern locales. (Left) William Clay Walker grave at Walker Family Cemetery, Panther Top Rd., Cherokee County, N.C. Photo Courtesy Carolyn Ellertson. (Right) Robert A. Aiken, former Captain of Company H, Walker's Battalion, wrote the history, or sketch, of Walker's Battalion for Clark's Regiments in 1901. On page 122, Aiken emphasized the enormous task assigned to the battalion as it strived to defend the great swath known as western North Carolina. Although Walker's Battalion would remain part of the Thomas Legion and never attain regimental status during the conflict, postwar many soldiers, including Aiken, would call it the 80th North Carolina Regiment. Clark, Walter ed. (1901). Histories of the Several Regiments and Battalions in the Great War 1861-1865, Volume IV. Goldsboro, North Carolina: Nash Brothers. While it was an era of lawlessness and of settling both old and new feuds, many born during the conflict, the wartime tentacles would extend and result in the calculated murders of many good folks. If battle or disease didn't kill a man, and if the soldier survived roving bushwhackers, pillaging deserters, and blood thirsty guerrilla groups, it may have been the soft knock on the door from none other than a neighbor who would arrive cloaked as the grim reaper himself. 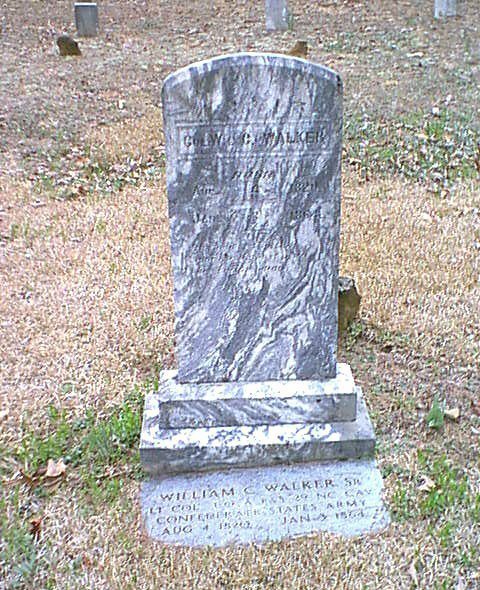 Prior to hostilities, a conflict now generally known as the American Civil War or the War of Northern Aggression, Mr. William Walker was a well-liked gentleman who had represented his constituents in the North Carolina legislature during 1857-58. He would raise the first company of soldiers from Cherokee County before being elected lieutenant colonel of the 29th North Carolina Troops. Whereas ailing health would soon force Walker to resign from the 29th, and though not yet fully recovered, he would promptly assist his old friend, William Holland Thomas, in forming the Thomas Legion. War is hell, it has been coined, and Walker would soon return to Murphy in December of 1863 with hopes of recovering from his lagging wartime health. (Right) This final report showing Lt. Col. William C. Walker commanding the battalion on January 31, 1864, was made in error. Maj. James A. McKamy had been temporarily commanding the battalion since September 11, 1863, but, following Walker's death, he would assume command until his capture at the Third Battle of Winchester on September 19, 1864. And although Walker had been killed on January 3, 1864, it would not be noted until after this return dated January 31. McKamy, subsequently promoted to lieutenant colonel, was also noted as commanding the battalion on two previous reports dated December 31, 1863, and January 8, 1864, respectively. (Official Records, Series 1, Volume 29, part 2, pp. 908-909; and Official Records, Series 1, Volume 32, part 2, pp. 535-536.) Notice that Thomas' Legion composed Jackson's entire brigade as stated in this January 31, 1864, return for the Organization of troops in the Department of East Tennessee. Official Records of the Union and Confederate Armies, Series 1, Volume 32, part 2, p. 642. His wife, Mrs. Elmira Walker, would always remember that calm and casual knock on the door just days following the ushering in of the sober New Year of 1864. Now a widow, Walker would raise her children alone before her passing nearly 35 years later on November 4, 1898. Lt. Col. Walker's murder also altered Col. William H. Thomas' view of the conflict and it served to reinforce his initial position and pleas to Confederate authorities to protect and defend North Carolina's western counties. Thomas had retained the Cherokee Life Guard in part because of Walker's death, and the Indians of this formation would remain close to him for the duration of the war. 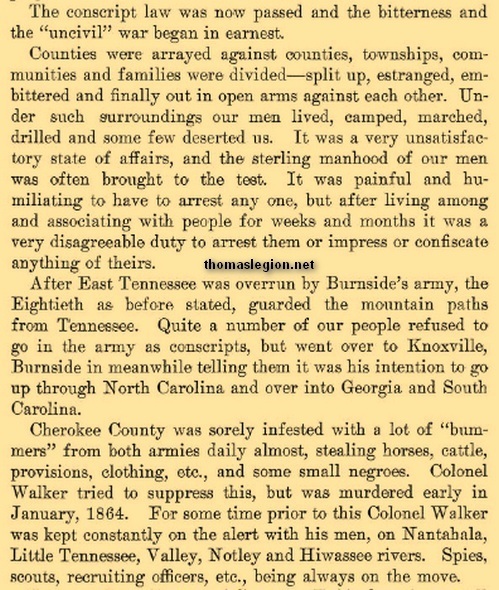 When Walker was "shot down like a dog" during the winter of 1863-64, according to Robert A. Aiken, the battalion historian, Thomas and the Cherokee Battalion were fighting bands of deserters and bushwhackers in the North Carolina mountains, and Walker's Battalion was performing provost duties while engaging guerrillas and outliers in East Tennessee. The regiment of the command would be detached and pushed into the Shenandoah Valley in May 1864 before rejoining the Thomas Legion in Western North Carolina during December 1864. (Official Records of the Union and Confederate Armies, Series 1, Volume 32, part II, p. 611.) The unified organization would end the conflict after its final action against Union troops in May 1865. It has been said that when a man is under immense pressure, that is when you really find out the character of a man, that is when you actually find out what a man is made of. While many in these parts would be seen under pressure by lending helping hands to hurting hearts, there was the fraction that openly extravasated raw hatred toward their fellow man. The war had brought out the best and it had brought out the worst in everyone. See also Shelton Laurel Massacre, O.R., IV, pt. 2, pp. 732-734, O.R., 1, 53, pp. 324-336, O.R., 1, 32, pt. II, pp. 610-611. (Right) Robert A. Aiken, page 125 of Clark's Regiments, stated that after Confederate conscription passed, it created an atmosphere which he referred to as uncivil war. Officially organized on July, 18, 1862, when Stringfield mustered its first company in Cherokee County, North Carolina. During July and August, the Battalion comprised the companies of Berry, Walker, Parker, and Cooper. Six companies were added in September but Parker and Cooper were transferred to the Regiment, Thomas' Legion. On October 1, the Battalion, 600 officers and men, was mustered at Knoxville, and William C. Walker was selected as Lieutenant Colonel. By the end of October 1862 the ranks increased to a total of 740 men. James A. McKamy was promoted to Major in August 1863 and assumed command of the Battalion, which was reduced to 500 men in September 1863. After Walker's death in January 1864, McKamy was promoted to Lieutenant Colonel. After McKamy's capture at the Third Battle of Winchester (Virginia) on September 19, 1864, during General Early's Valley Campaign, Lieutenant James A. Robinson led a portion of the Battalion during the remainder of the Valley Campaign and until it returned to North Carolina in December 1864. In February 1865, General James Green Martin officially placed Stringfield in command of the Battalion, but Captain Stephen Whitaker would lead the unit at the end of the war. The Battalion was known as Walker's Battalion, McKamy's Battalion and at times simply as Battalion. When Thomas officially organized the Indian Battalion at the end of the war, Walker's Battalion became known as First Battalion, with the Cherokee Battalion referred to as Second Battalion. When the unit mustered at Knoxville it had 7 companies, including 3 of Tennessee cavalry. The mounted units were all transferred from the Battalion in December 1862, so that during most of the unit's service it only had 5 infantry companies. The arduous service of this battalion was summarized by its historian Captain Robert A. Aiken. Immediately after its organization, Aiken recorded, Walker's Battalion was "scattered along the Bristol and Chattanooga Railroad," guarding bridges, depots and block houses, towns and communities. The unit was "also arresting conscripts, deserters, and doing other provost duties," said Aiken. "The four counties of Cherokee, Clay, Graham, and Swain, were disputed territory all this time." Aiken reported that "while large bodies of Federals seldom came out, yet small scouts were constantly depredating upon and killing the citizens and taking off many to prison. Colonel Walker was murdered at his home near Murphy on the night of 3 January, 1864, while there on sick leave." Aiken affirmed that "Cherokee County was sorely infested with a lot of 'bummers' from both armies daily almost, stealing horses, cattle, provisions, clothing, etc., and some small negroes. Colonel Walker tried to suppress this, but was murdered early in January, 1864." The men of this battalion would be numbered among the last to surrender East of the Mississippi. On May 14, 1865, and more than a month after Lee had surrendered to Grant, Maj. Stephen Whitaker and battalion would surrender and be paroled in Franklin, N.C. See also The Last Shot of the American Civil War. *Lt. Col. William C. Walker commanded Walker's Battalion of the Thomas Legion, and his command was referred to by many who filled its ranks as the 80th North Carolina Regiment, but it was never officially recognized as the 80th nor did the unit ever meet regimental strength. While some of its men did believe that the battalion at one time hosted regimental numbers, it remains a mystery as to why, because once the mounted units were transferred in late '62, its rosters began to thin as attrition took its course. Others perhaps thought that it was going to be increased to a regiment, but absent any official writings to corroborate either, it remains a battalion. Following the war, many a veteran turned author would write showing the unit as the 80th, but they too were writing more on hearsay than fact. **Lt. Col. McKamy commanded the battalion following the death of Lt. Col. Walker, but when McKamy was captured at 3rd Winchester, Lt James A. Robinson assumed command of the Battalion for the remainder of the Shenandoah Valley Campaign, from September 19, 1864 until its return to North Carolina with Special Order 267. Lt. Col. William Stringfield would then assume commandership, with Captain Whitaker leading the unit at war's end. Recommended Reading: Bushwhackers, The Civil War in North Carolina: The Mountains (338 pages). Description: Trotter's book (which could have been titled "Murder, Mayhem, and Mountain Madness") is an epic backdrop for the most horrific murdering, plundering and pillaging of the mountain communities of western North Carolina during the state’s darkest hour—the American Civil War. Commonly referred to as Southern Appalachia, the North Carolina and East Tennessee mountains witnessed divided loyalties in its bushwhackers and guerrilla units. These so-called “bushwhackers” even used the conflict to settle old feuds and scores, which, in some cases, continued well after the war ended. Continued below. The authenticity of his book is heightened by the many drawings that a comrade, Charles W. Reed, made while in the field. This is the story of how the Civil War soldier was recruited, provisioned, and disciplined. Described here are the types of men found in any outfit; their not very uniform uniforms; crowded tents and makeshift shelters; difficulties in keeping clean, warm, and dry; their pleasure in a cup of coffee; food rations, dominated by salt pork and the versatile cracker or hardtack; their brave pastimes in the face of death; punishments for various offenses; treatment in sick bay; firearms and signals and modes of transportation. Comprehensive and anecdotal, Hardtack and Coffee is striking for the pulse of life that runs through it. National Archives and Records Administration; Walker's Service Record; Stringfield's Service Record; McKamy's Service Record; Parker's Service Record; Robinson's Service Record; W. H. Thomas's Service Record; Moore's Roster; Hunter Library, Western Carolina University; Official Records of the Union and Confederate Armies; Vernon H. Crow, Storm in the Mountains: Thomas' Confederate Legion of Cherokee Indians and Mountaineers; Walter Clark, Histories of the Several Regiments and Battalions from North Carolina in the Great War 1861-1865; National Park Service: American Civil War; Weymouth T. Jordan and Louis H. Manarin, North Carolina Troops, 1861-1865; D. H. Hill, Confederate Military History Of North Carolina: North Carolina In The Civil War, 1861-1865; Christopher M. Watford, The Civil War in North Carolina: Soldiers' and Civilians' Letters and Diaries, 1861-1865. Volume 2: The Mountains; Library of Congress; National Archives and Records Administration; State Library of North Carolina; North Carolina Office of Archives and History; North Carolina Museum of History; E. Stanly Godbolt, Jr. and Mattie U. Russell, Confederate Colonel and Cherokee Chief: The Life of William Holland Thomas; Paul A. Thomsen, Rebel Chief: The Motley Life of Colonel William Holland Thomas C.S.A.